When we left for the Missouri this past Friday, it was flowing at about 18,000 cfs below Holter Dam. 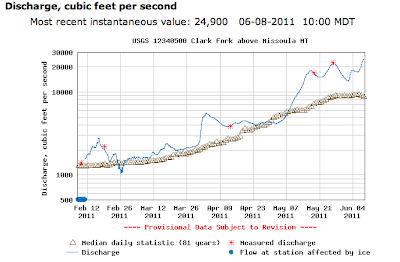 When we arrived in Craig on Friday night, the Mo was flowing at 21,000 cfs. This 3k rise in water was a recipe for bad fishing. The day of poor fishing was confirmed back in Craig as many of our fellow fisherman shared our luck. To be expected I suppose. Rising water always displaces fish and they need time to adjust to the new conditions. Instead of catching a lot of trouts, I tried my hand at casting on the recently submerged Craig campground; I caught one 12" brown trout; I checked out the worm hatch; and I was heckled. We went to Craig for more than just fishing. The F3T was in town and Headhunters had a gaggle of pre-film activities planned for the night. There was free bbq, a $1 dry fly sale, vendors, free beer, a casting contest, free bbq, free beer, free films, free swag, and other free things. After a day of skunktastic fishing, free food, beer and swag was a nice pick-me-up. The guys at Headhunters know how to have a good time. Bucko took second in the casting competition. He lost by one point. If he had managed to strip off 2 extra feet of line, he would have taken home a knife and a hat and the pride of being the best. Instead, he just got a hat and the title of the best loser. I didn't take any video or pictures of the celebration. But, SOL and John Arnold of HH were all over the place taking photos and hopefully they will make it on to the Headhunters blog in the near future. I also ran into Zach from False Casts and Flat Tires (another Missoula-based fly fishing blog). His camera was in tow, so look for some pictures from the festivities over on FCFT. I need to fish the Swan River this year. I don't know if the Swan has swarms of bull trout like the Metolius does, but apparently it is a pretty healthy Bull Trout fishery. Why It Is Not Fun To Be A Whitefish On The Metolius River from Chris Eaton on Vimeo. 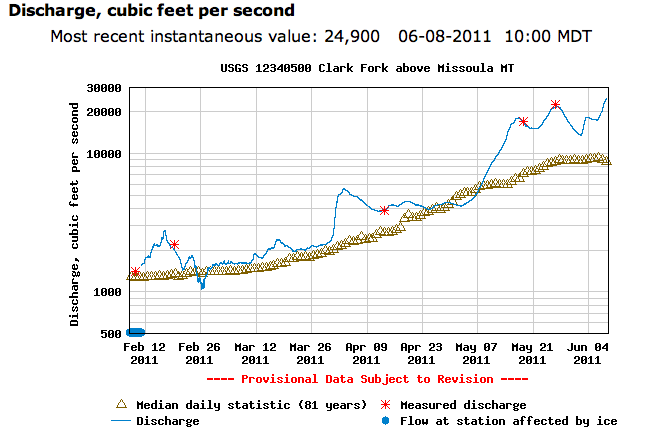 The Clark Fork River, which flows west through Missoula, is flowing at historically high levels right now. If you don't live here or didn't study this river for 3 years, you might not be as excited about these high flows as I am. It should be no surprise, that when temperatures rocket into the 80s (in the valley) and some significant rain quickly follows, that the still sizable snowpack in the Upper Clark Fork basin will begin to melt. Currently (as I type), the Clark Fork above Missoula is flowing at 24,900 cubic feet per second (cfs), higher than I have ever seen it during my time in Missoula. And it is rising. The National Weather Service is predicting that the CFR will peak at around 13.39 feet 14.8 feet 13.95 feet or approximately 30,000 cfs 34,000 to 35,000 cfs 31,000 cfs on Thursday. If it peaks at around 30,000 cfs 34,000 to 35,000 cfs 31,000 cfs, the flows will be the fifth second fifth largest during the 82 years of record. Larger flows will only have been experienced in 1908, 1948, 1975, and 1964. As a fluvial geomorphology nerd, I am excited. Excited to see a 16-year 40-year 16-year Recurrence Interval flood. 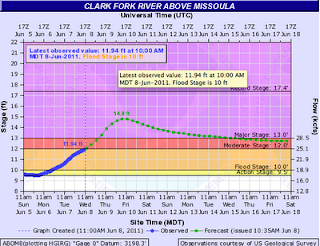 Excited to see the Clark Fork hit Major Flood Stage. 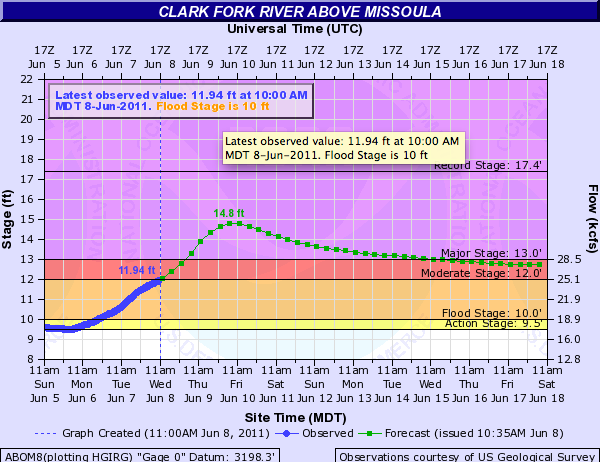 Excited to see how the restored section of the Clark Fork holds up and adjusts. Hopefully the people and properties around Tower Street are relatively unharmed. UPDATE: NWS has estimated that the peak flow will be pushed back to Friday and will top out at 13.95 feet, which is the equivalent to about 30,500 to 31,000 cfs. Still a significant flood. Not the second biggest of all-timessss though. I am done updating this until the peak actually happens. PICTURES TO FOLLOW TONIGHT AND TOMORROW. This past Tuesday, I headed down to Dillon to fish the Beaverhead with Joe/Jergens/Joey Dubs from Evolution Anglers. It was a great day on the water and a solid day of fishing. The Beaverhead, a tailwater, is seemingly the only low flowing river in Montana at this time. The water managers were only letting out about 400 cfs of water when we fished it on Tuesday. I have only fished the Beav at double that flow, so I was a little odd to have the low flows, but I quickly got over that fact when I realized how much wade fishing was possible. The largest fish we managed was an 18-19" brown trout, not nearly the size of fish that Joe managed throughout the week. Blame it on the cloudiness in the water downstream of the High Bridge. Blame it on late hooksets and poor nymph placement by myself. Whatever you do, don't blame it on Joe, a great fisherman and guide at the Stonefly Inn. I hope to do it again sometime this summer. It was a good day. Enjoy the video with an ode to the Boom Goes the Dynamite Guy. YGF X Evolution Anglers: BOOM GOES THE BROWNOMITE from Yukon Goes Fishing on Vimeo.